DAILYKENN.com -- Posters declaring, "It's okay to be white," have appeared near a Maine college and, thanks to media exposure, have been seen by countless thousands. Leftists at Bates College in Lewiston, Maine were so offended they reported the posters to police and, more importantly, contacted multiple media outlets. Activists leverage high-strung, delusional leftists to unwittingly propagate their message. First, the activists purchase full-sheet labels and, using their computers, print 'IT'S OKAY TO BE WHITE' on them. Second, they post the labels near college campuses where leftist moonbats are concentrated. Third, they sit back and watch as triggered leftists contact various media outlets. Fourth, the media produce stories about the posters, condemning them as racist. As a result, a single poster can be viewed by countless thousands of individuals. 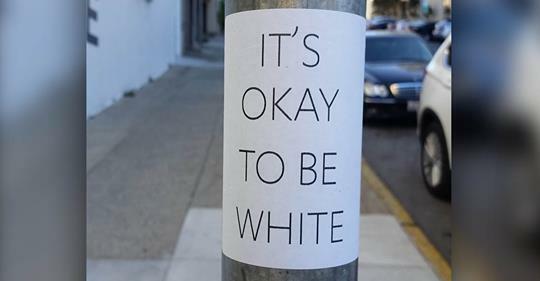 Signs popped up around the Bates College campus Sunday reading “IT’S OKAY TO BE WHITE,” a slogan devised almost two decades ago by neo-Nazis.